Now that the rich Dentist Profit Systems “dentist branding and marketing ecosystem” is driving new patients to inquire about your distinctive services, the right response from your front office will convert these calls to appointments at a high rate. Our goal for you is 80% conversion. As our client, we provide recording of your front desk phone conversations, real-time analytics, and coaching to improve your rate of conversion. Here’s why. The success of your dental practice depends largely on your ability to attract new patients. While a comprehensive marketing strategy and a killer website are certainly important, they won’t do you any good if your administrative team is not equipped to handle the new business they bring in. Your dental practice growth depends on your front office team and their ability to make a great first impression. From the moment they answer the phone, they are on stage. Their ability to shine in the spotlight will determine whether a potential new patient actually finds his or her way to the dental chair. Because of the role your office team plays in the overall growth of your practice, it is important to provide them with the tools and training they need to succeed. Our Patient Prism Analytics System is a dynamic tool that helps our clients’ front desks improve their skills at a fast pace and succeed at conversion. The initial phone call gives you and your team an opportunity to impress potential new patients. It is also important that your team learns how to communicate what drives your practice and what truly sets you apart from the competition. In all likelihood, you want to be remembered for your compassion, knowledge, and efficiency. Your new patients won’t experience that from you until well into their first appointments. Therefore, it is essential that your front desk team know how to translate this over the phone. First, set up a standard greeting. It doesn’t have to be crazy to be memorable. A simple, “Good morning. Thank you for calling Dr. Smith’s practice” is fine, provided that it is delivered with warmth and sincerity. Make sure that each member of your staff is delivering the same greeting with equal poise and authenticity. Second, ensure that your administrative team is willing to take the time to effectively communicate with potential new patients. You would take all the time a patient needed to answer questions during an appointment. In the same way, your office team should never rush a phone call. This is probably the number one way to frighten off a new patient. A willingness to answer questions will mean nothing if your office team is not prepared to answer them. Of course, your administrative staff does not have to be fully informed about the clinical side of dentistry, but they should have a working knowledge of how things work. It is important to provide basic training regarding common dental problems and treatments. Make sure your office staff knows what you do during cleanings, what kind of x-rays you offer, what materials you use to make crowns, at what age you start seeing children, etc. If you have recently put out a big marketing push regarding some new tool or procedure, it is especially important for your office staff to be aware of this technology. They should also be able to answer questions about financing and insurance. This means setting standard policies for all paperwork and financial information. Your staff should be fully trained in these protocols prior to beginning their work with new patients. Two of the most challenging questions are “How much does it cost?” and “Do you accept my dental benefits plan?” Even if you have supplied your front desk with the response you would like them to give to those questions, answering those questions prematurely can lessen the potential of the conversation. Your front desk should be coached to do their best to engage callers on a personal and empathetic level, encouraging callers to talk about their needs and concerns. This will provide your receptionist with opportunity to compassionately offer an appointment to address those needs and to speak about your expertise and friendliness with enthusiasm — prior to answering financial questions. Begin the day with the most complex and time consuming procedures. This will give you more flexibility later in the day when you are more likely to have an influx of patients. Establish how many patients you need to see per day to maintain profitability. Overscheduling to boost income will only backfire in the long run. Use your dental assistants to their full potential. Always put the patient’s priorities first. Whenever possible, schedule appointments when it is most convenient for them. Of course, neither you nor your office team are going to achieve superior customer service skills on your own. It is important to work together to find the exact methods that will work for you and your practice. Begin by assembling a list of common questions that potential new patients ask. Include questions about clinical protocol, scheduling, insurance, and financing options. Provide training in dealing with emergency calls. Your team should be able to effectively communicate and soothe a frightened patient who has just lost or broken a tooth. Communication classes can greatly benefit your office staff (and your entire team). Often, your administrative team will have their own suggestions for improvement. Allow them to be an equal participant in developing and building your practice. This will add to their job satisfaction, and it will have untold benefits for your practice. Let us demonstrate the power of our Patient Prism Analytics System. 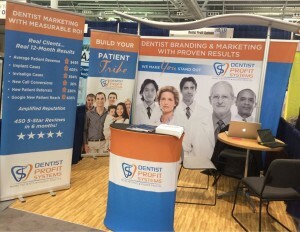 If you are at the 2015 Yankee Dental Congress, drop by Booth 1446, and attend Amol Nirgudkar’s Saturday morning 2-hour free CE presentation: State-of-the-Moment Business and Marketing Strategies for Dentists. Our ROI statistics from real 12-month client experiences in 2014 will wow you.